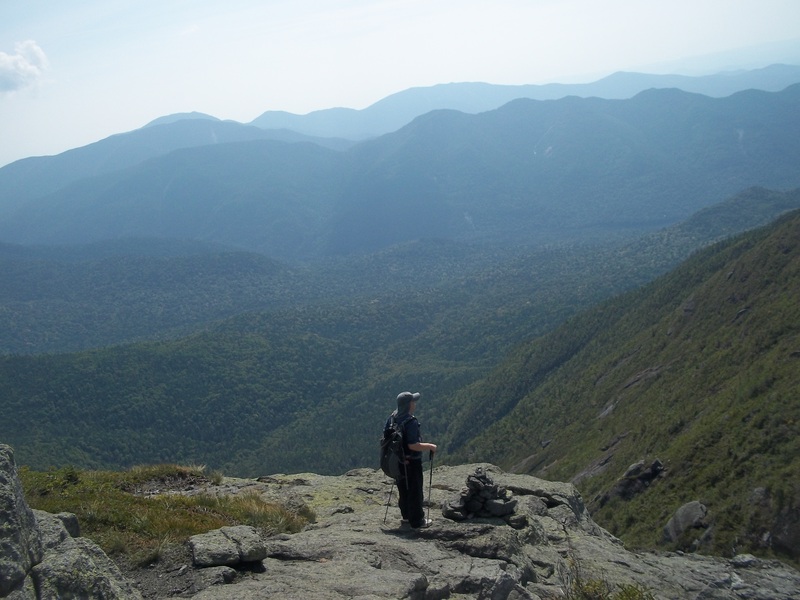 On Friday night my hiking partner and I stayed at the Johns Brook Lodge, a 3.5 mile hike in from the Garden trailhead, to shave off a few miles at the beginning of our long day of hiking Haystack and Basin. 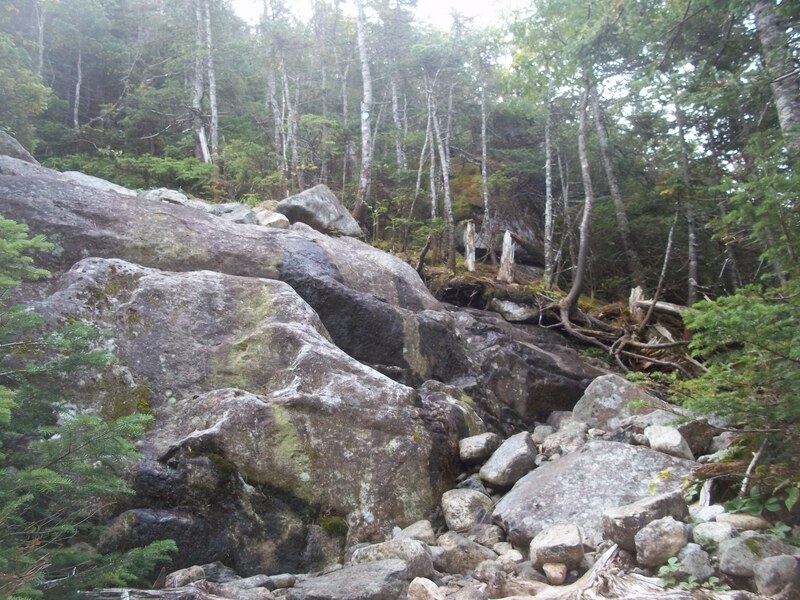 I was really happy to be able to hike these two from the JBL, as they are so far out and therefore difficult (unless you are a faster hiker than I) to do in a day. Most of all, I was thrilled to cross Basin off my list. Though I can’t remember a time I haven’t looked forward to climbing each and every mountain I’ve set off to conquer, I have to admit that Basin is one that I wouldn’t have attempted if I wasn’t an aspiring 46er. It’s known for being challenging and most would agree that it’s the toughest of the Great Range, some ranking it the toughest of all 46. I found it to live up to its reputation. At 6:00 a.m. on Saturday morning we set out from JBL along with a third hiker who joined us, having tent-camped nearby the night before. We picked up the Phelps trail and took it past Slant Rock. What an absolutely beautiful hike this was; I had no idea what this end of the Phelps trail looked like until yesterday. 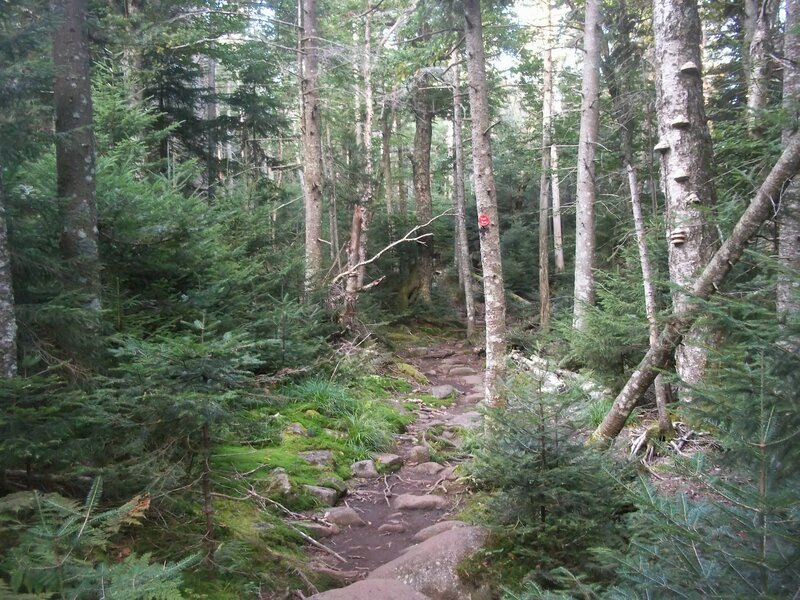 It runs along Johns Brook for a bit crossing back and forth a couple of times, and then the trail opens up into a gorgeous spruce forest with tons of bright green ferns and moss. The only wrench up until this point: just before reaching the forest, we accidentally disturbed a nest of angry wasps as we passed by. I was lucky to escape with only one sting (which hurt like a son of a b*tch all day), but one of my hiking buddies was not so lucky and ended up with 10 or 11. It’s almost impossible to describe where it is on the right hand side of the trail as there are no real markers coming from the Lodge, but coming from the other direction there are 3 orange flags in the trees on the right side just before the nest, which is near the base of a tree on the opposite side of the path. 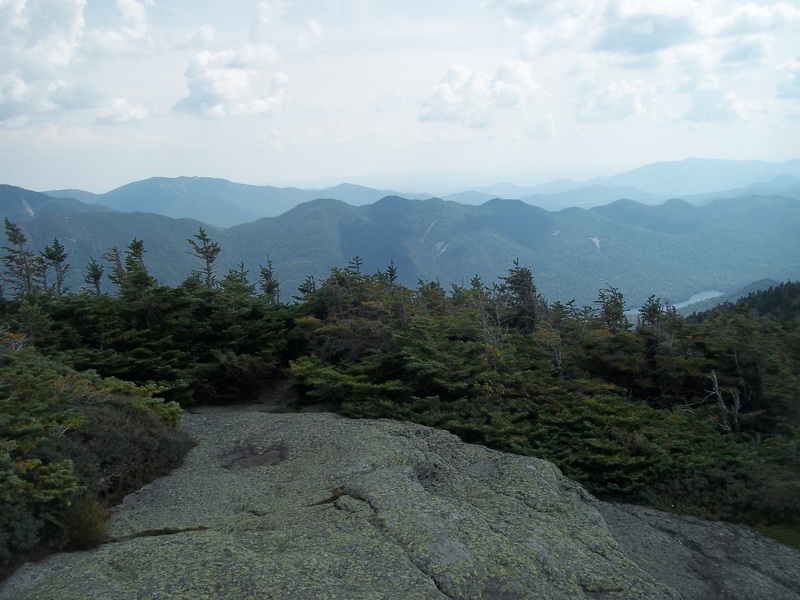 We picked up the State Range Trail to Haystack and begin our journey to Little Haystack, which we had to climb first (and twice, as we also had to climb back over it on the return from Haystack). These two mountains were so much fun to climb. When you come out of the trees you see them both in front of you – massive piles of rocks that you can’t imagine being able to climb too easily. But they weren’t as steep as they appear when you are facing them. You are on exposed rock for quite awhile and there are a few tricky-ish challenges, but nothing too crazy. 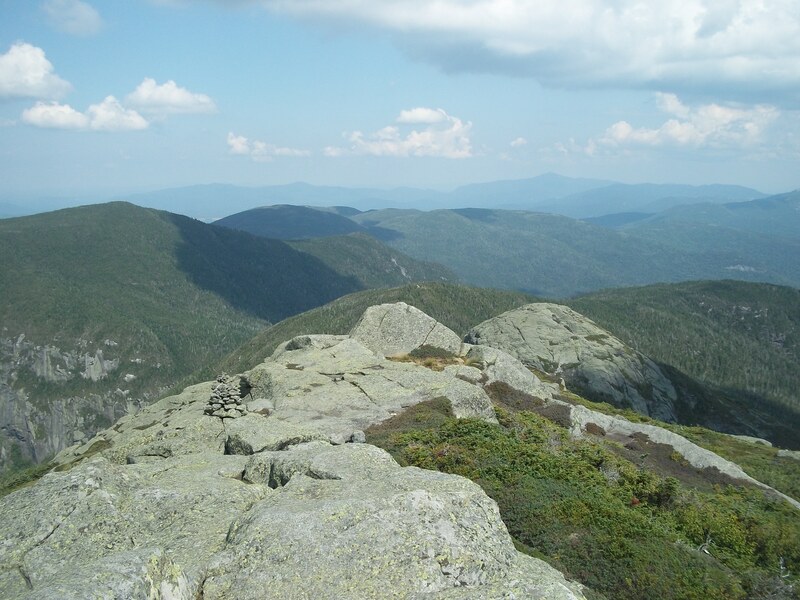 Haystack is known for being #1 for views, and the sights from summit were incredible. 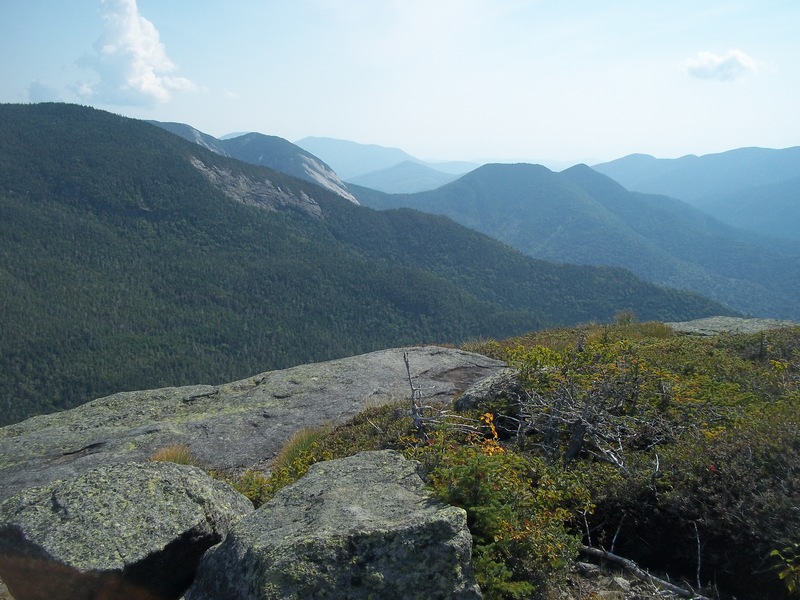 The hike from JBL to Haystack via the Phelps trail is my favorite Adirondack hike to date. I had such a great time on this one, and will definitely do it again someday. After Haystack and Little Haystack we headed on over to Basin. I was really afraid of climbing this mountain and I know that part of it was purely psychological, as I’d built the challenge up in my head. It was a steep climb and there were definitely a few parts that I had a really tough time with. It was very technical in places and required a great deal of thought with regard to picking your route both up and down the rock. I had a few moments on the descent where the fear almost overtook me, but I managed to get down the most challenging parts without slipping and have never been so happy to touch bottom after a climb. 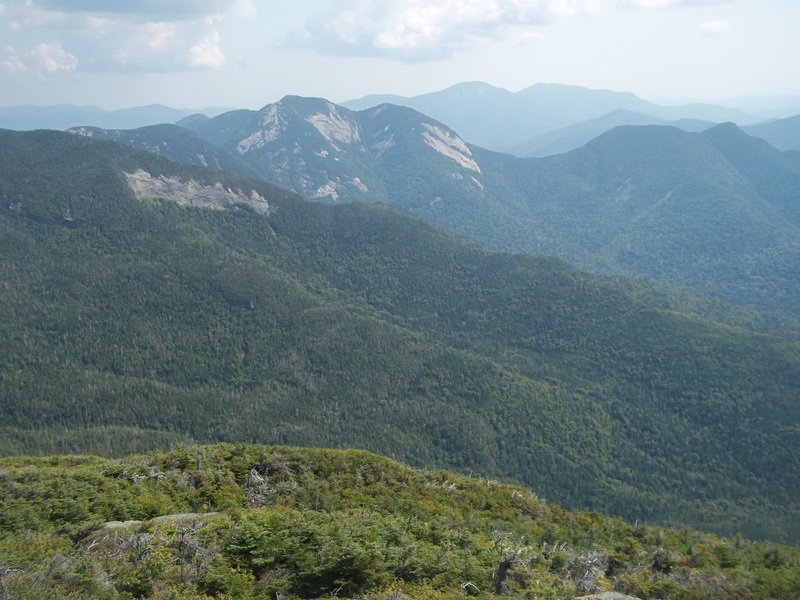 This is one I will not be repeating and I’m thrilled to have decided to climb Saddleback separately, as many opt to do it together with Basin. That route requires (most commonly) the descent of Basin on the steeper side to the col, and then up the very steep Saddleback cliffs. I’m happy to do Saddleback another time from the gentler side where it faces Gothics as it’s not a terribly challenging climb, and even more happy that I can now head into the winter knowing that Basin is behind me. We took the Shorey shortcut back to the Phelps trail. I’ve heard it was rugged and steep, and it was… but I think I had built it up more in my head and didn’t find it to be as bad as I was anticipating. It was quite annoying to have to ascend a good deal of elevation at the beginning just to lose it again heading toward Phelps, but the most annoying thing we faced on this route was that it started raining just as we were starting the fairly steep descent. 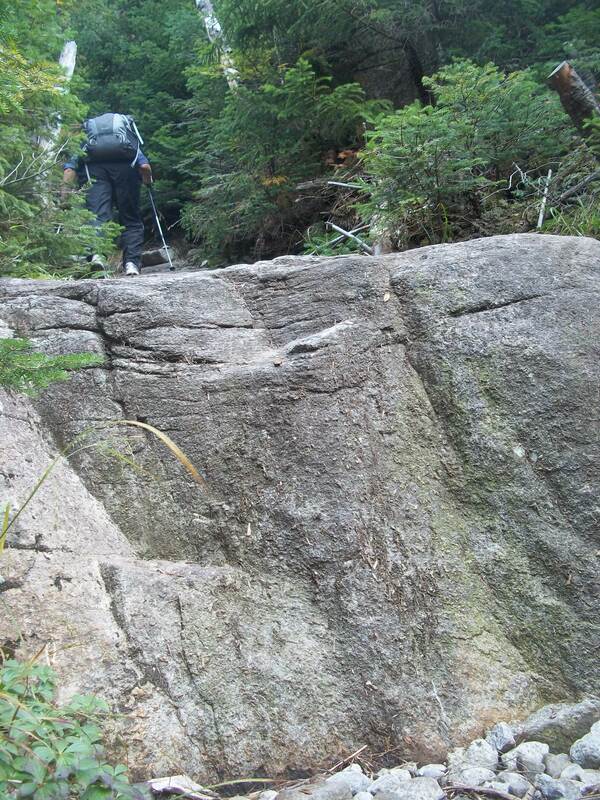 It made for a slow-going climb down to Slant Rock. It was a long day… we were pretty tired when we arrived back at JBL to grab the rest of our things, and a bummer that after a long day of climbing 4 peaks we still had to double the weight we were carrying and hike the 3.5 miles back to Garden. Daylight disappeared from the sky while we were still a couple miles from the parking lot which slowed us down even more, and it was challenging staying on the trail – it gets so dark in the woods that even our headlamps and flashlights barely cut through the blackness. Seeing taillights from the cars in the lot reflecting back at me was the most glorious part of this portion of the hike. 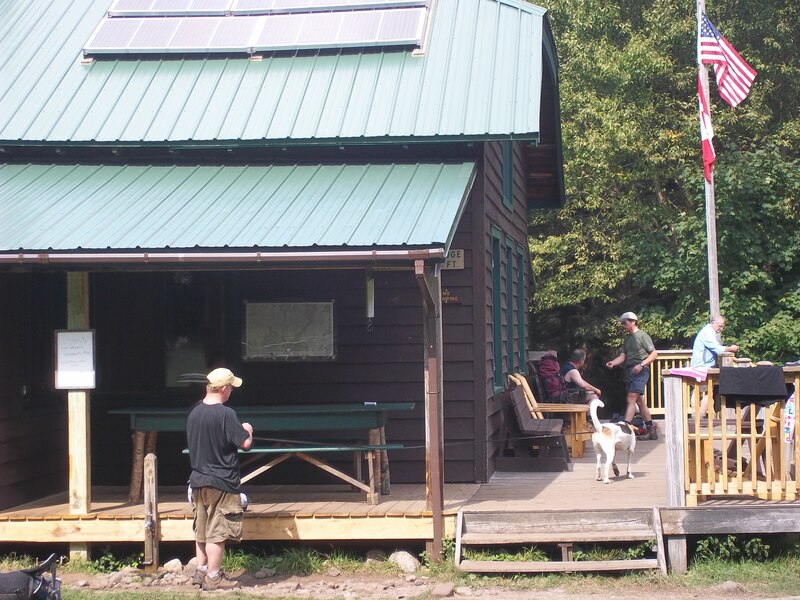 Johns Brook Lodge, a carry in/carry out hiker hostel 3.5 miles into the woods, owned and operated by the ADK. The 2-3 people who work here on a given day carry in all supplies and food for a three course meal every day, for all the guests of the lodge. They deserve big tips. 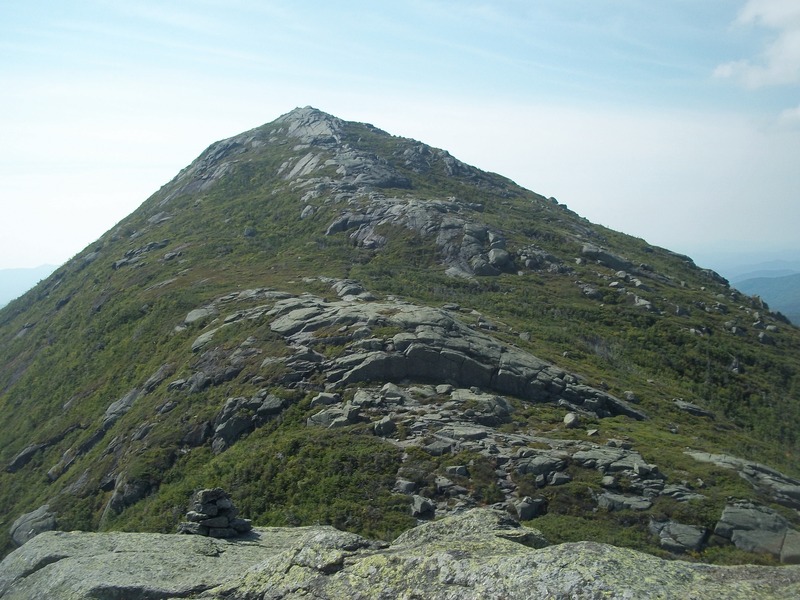 Now you know why I had to hike Haystack again- having seen it from Basin and appreciating its view of Marcy, and then to encounter horizontal rain with zero visibility from the summit was just not the experience I had so anticipated. The sun came out on Shorey’s “Short” (really?) -cut 😦 and that elevation issue is such a bummer! BTW, wasn’t that “rock” you mentioned in the photo caption actually “Little, Little Haystack”? Once again, congratulations, Pru! 20 is the point that I started to redouble my efforts to the finish-line but you’re so going full speed already!! Way To Go!! 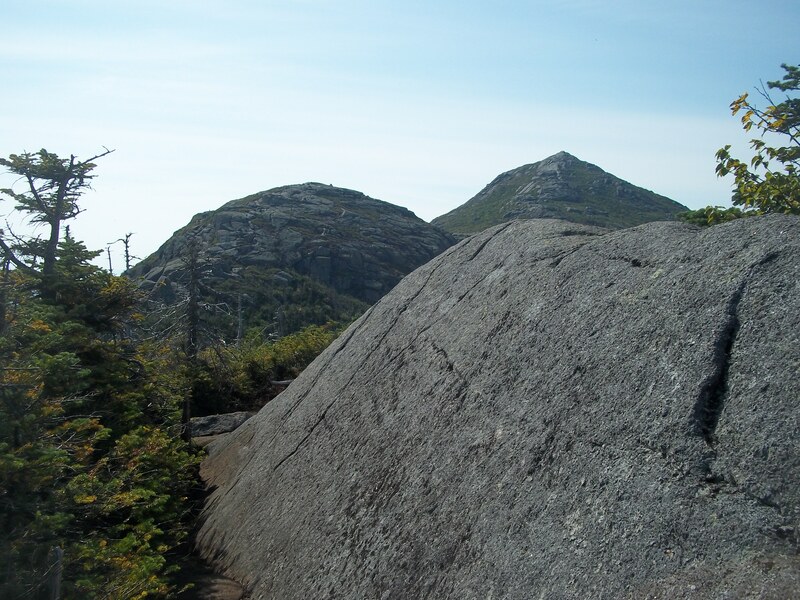 I loved Haystack and Little Haystack – what a great hike all around! I can’t wait to do it again, though the repeat probably won’t happen until I finish the rest on my list. It’s too bad you had such lousy weather your first go at it, but glad you had a chance to see it again in all its glory! I’ll do Gothics with you sometime. And if I don’t get to Saddleback this year, will let you know when I’m doing it next year! Beautiful pictures! We ran into those damn wasps too when we were there last week! I escaped unscathed but my dad got stung a couple times. The last few miles are always the worst eh, so glad I only had my day pack though! Thank you, and wow – it seems someone needs to mark that nest! I wondered if that’s what the orange flags were, but it doesn’t help if you’re coming from JBL. 😦 I’ll check your blog now to hear about your trip! I need to subscribe by email because I don’t get alerted when you post. 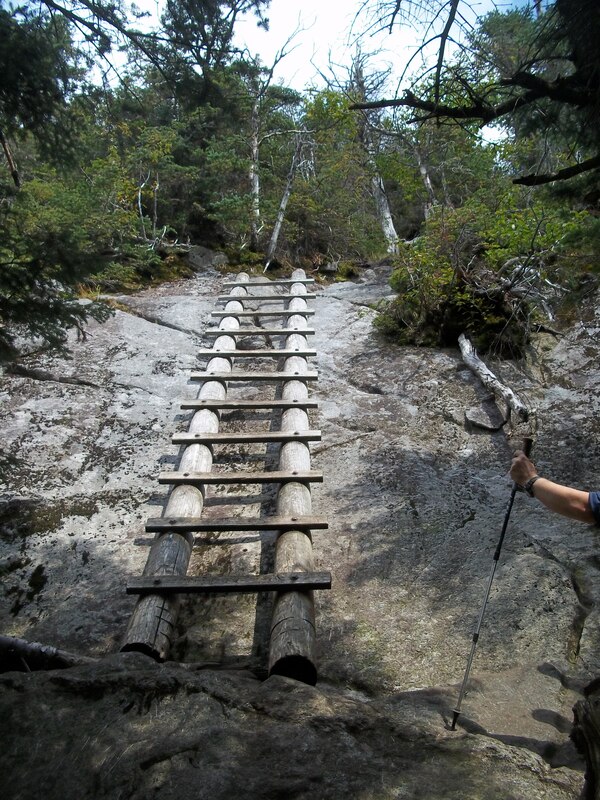 Really cool appearing trail. I think I got bitten by a wasp in Ecuador this year. Wasn’t pleasant, soap and water was all I needed, is that all you need to heal a wasp bite? Does bug spray deter wasps? Two more mountains and you’re half way towards your goal, I didn’t realized that you’ve already hit 21. Would absolutely love to do one of those mountains with you some day, tentatively next year but it’s impossible to get that far ahead of myself. I don’t think bug spray deters wasps, but could be wrong. Best thing to do is avoid walking through a nest. Luckily I had Benadryl in my first aid kit which helped, and no one was allergic. Too bad you couldn’t come up for a visit before you headed out. Hopefully next year. 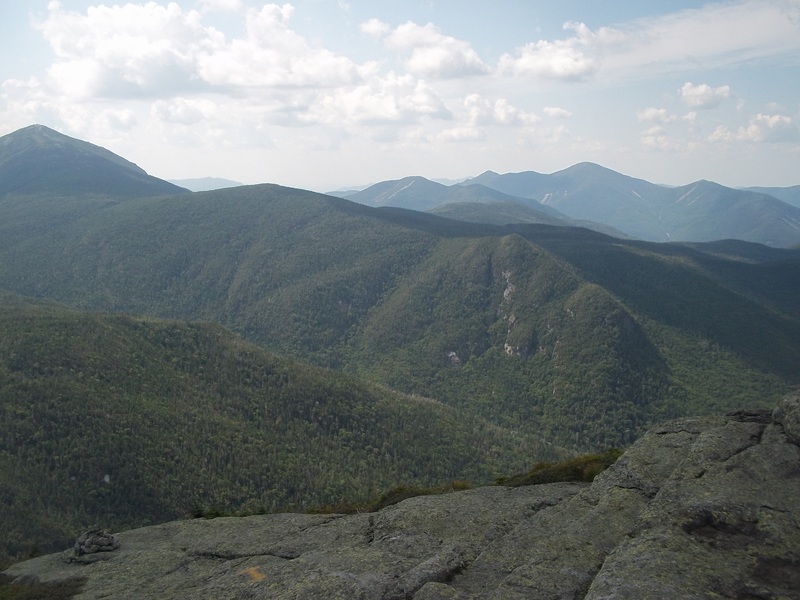 Maybe you could hike my 46th with me – Colden is supposed to be a gorgeous hike and I’m saving it for last… should happen sometime next summer, if I can stay on track. Pru, you are definitely on a mission. Almost half way there! You’ll probably get a few more in before the weather changes. So I look forward to hearing all about them through this blog. Have a great Labor Day weekend!!!! Hope your Mom is good. ” Onward and Upward”, Pru. Have Fun! Thanks for the note, Suzanne! Will see my mom this weekend and pass along your well wishes. 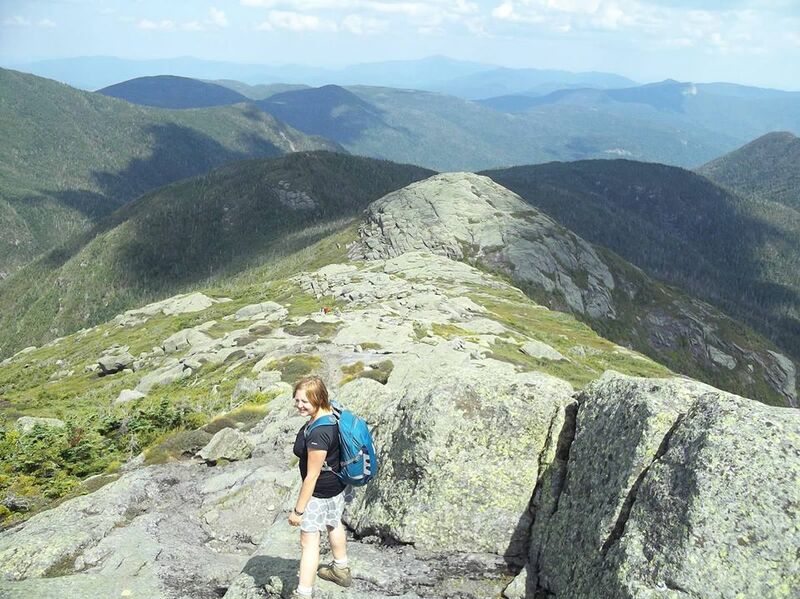 Looking forward to hiking with Karen this weekend; too bad you’re not able to join us. I hope all is well with you and your family, and talk soon! Awesome views from Haystack! No wonder so many choose this peak for their 46er finish. Congrats on checking the box on Basin too…Saddleback should be a piece of cake for you! Thanks John… Saddleback is no longer anxiety-provoking, now that I’m doing it from Orebed. Hope to hike it this fall. 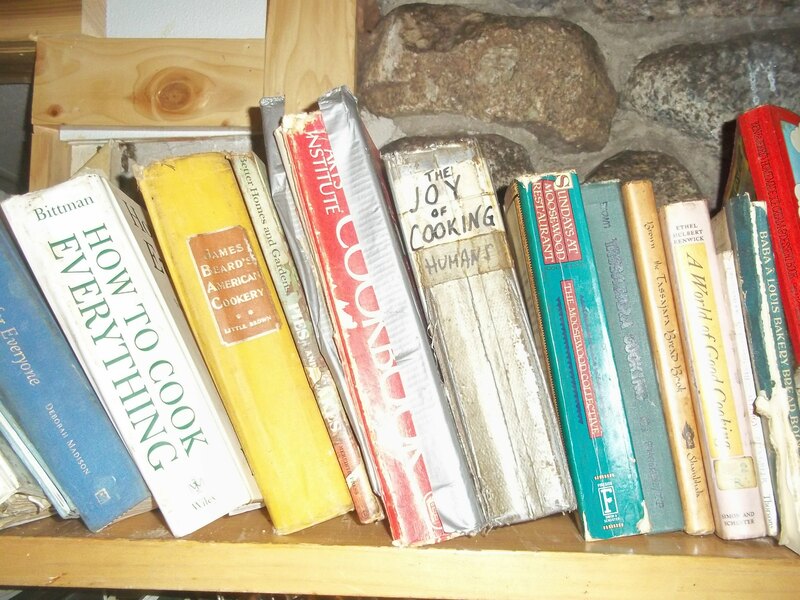 I absolutely loved Haystack…if I’d known how much I was going to enjoy it I might have saved it for my 46th! But it’s one I’ll look forward to doing again for sure. Well done, Pru. That’s a very long tough day and doesn’t need the accompaniment of wasps or the slog out to the Garden at the end. Being terminally lazy, I’ve always opted for supper and a second or third night at JBL although their bar is a bit skimpy for my liking! 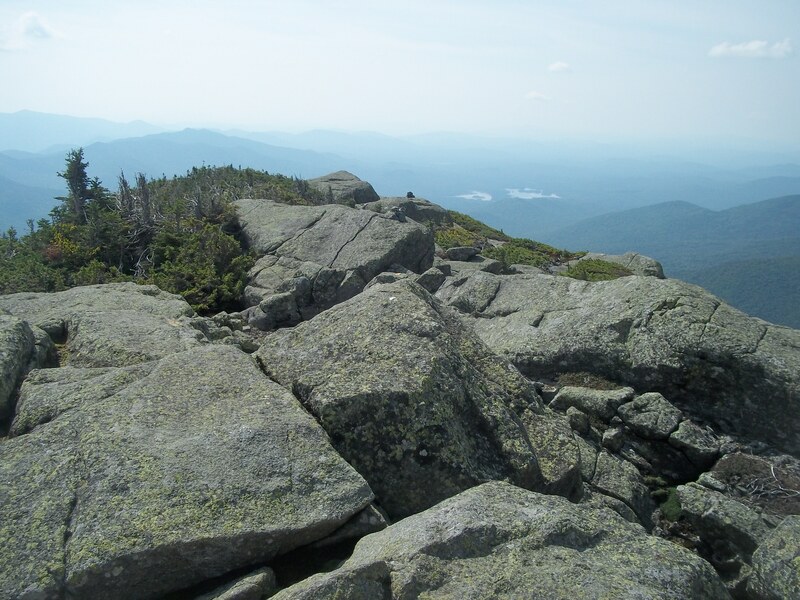 I didn’t find the col between Basin and Saddleback to be any harder than the side you negotiated. I don’t recall a ladder on the east side, or a need for one for that matter. Thanks for reading, John! I agree… a very long day, and though the wasps were but a blip in the day (for me, anyway, with only one sting), the end of that hike was definitely tough! Still, isn’t it funny how you never remember that stuff as much as the good parts, when you look back? I heard recently from someone else that he thought the side of Basin we did was tougher and not easier… either way, I’m glad we did the route we chose. Great to finally see the pics for the hike…along with the text. It brings back great memories of that day. Hoping to hike with you real soon. Thanks for sharing Haystack and Basin with me!! !